Sometimes, it is that little touch of detail that makes your medieval look really shine. 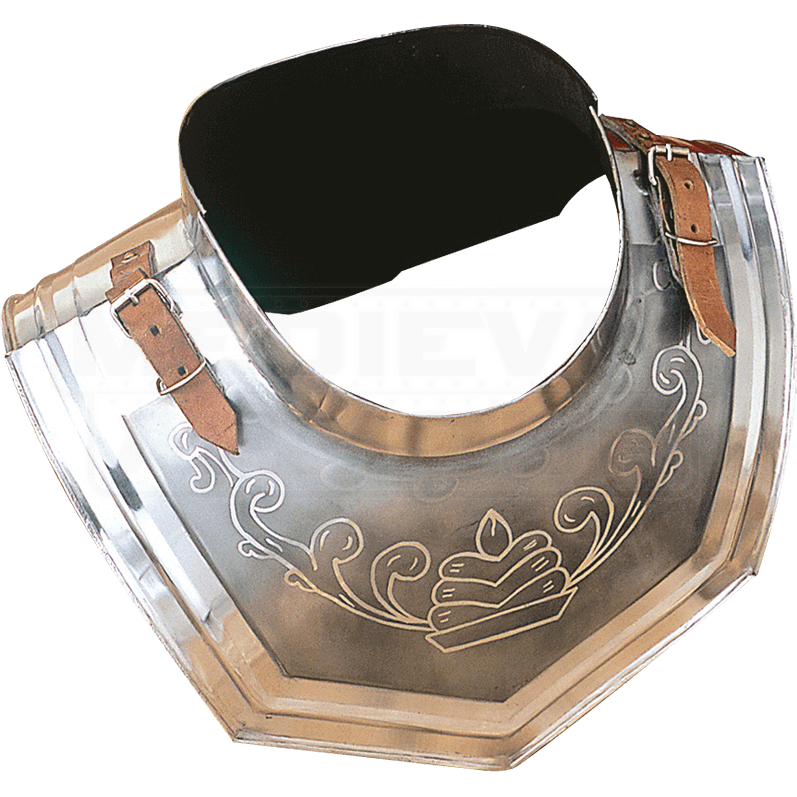 And with this Etched Medieval Gorget, that statement can be taken quite literally, as this neck-protector has a polished gleam and a fine touch of intricate detail! This handsome gorget is made entirely from 18 gauge steel and is a perfect match to our Etched Medieval Breastplate (item number AH-3887E), although it looks equally great when worn as its own accent. The gorget provides great protection to the neck and collar, while also featuring an elegant etched pattern of florate and leaf designs, as well as a polished steel finish that gleams in the light. The gorget is split into two pieces (a front and a back) and is secured together via attached leather straps that give the gorget a bit of adjustability in its sizing. It is offered in one size, and the 18 gauge construction makes it perfect as costume armor, as well as ideal defense for LARPing, light combat, and some light reenactment. Paired with its matched breastplate or worn alone - either way, this Etched Medieval Gorget is a gem that is sure to shine, and in doing so, an accent that is sure to attract some attention your way, whenever you wear it. One size fits most. Fits up to a 27.5 Inch Neck.